Corporate is an American 30 minute scripted comedy television series, which kicked off on January 17, 2018, on Comedy Central and is broadcast every Wednesday at 22:00. The show is currently in its 2nd season. Comedy Central is yet to announce the renewal of Corporate for Season 3 as well as its cancelation. Sign up to track down the show's status and its release date. Corporate is a dark, satirical workplace comedy that follows Matt and Jake, two junior executives-in-training who are forced to do the dirty work of the higher-ups at one of the world's largest corporations, Hampton DeVille. Season two of the critically-acclaimed Corporate will feature its own lineup of star-studded guests with Kyra Sedgwick, Elizabeth Perkins, Kristen Schaal, Sasheer Zamata, Baron Vaughn and Andy Richter. Corporate stars series' creators/writers/executive producers Matt Ingebretson and Jake Weisman as two Junior Executives-in-Training at Hampton DeVille, a heartless, corporate hell-hole led by tyrannical CEO Christian DeVille (Lance Reddick) and his top lieutenants, sycophants John and Kate (Adam Lustick and Anne Dudek). 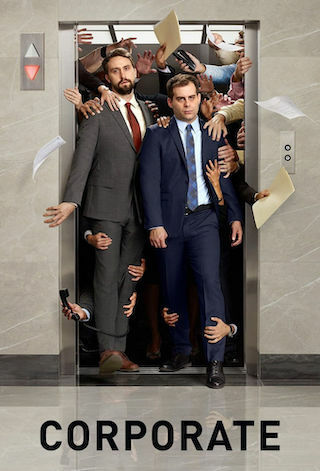 As Matt and Jake navigate an ever-revolving series of disasters their only ally is Grace (Aparna Nancherla), a Hampton DeVille Human Resources rep who is beleaguered by both her job and her exhausting relationship with the very needy Matt and Jake. Corporate is directed by co-creator Pat Bishop.